Hmmmm.... every day there seems to be some sort of crime in Palmdale and the Antelope Valley splashed across the pages of the local rag, offering a little something for everyone, from redneck meth dealers and crazed desert rats holding off an army of cops to assorted gangs imported from LA going ballistic on school teachers, plus the usual suburban real estate scams and municipal graft (I think they call it "Palmdale" because of all the palms that are out) and good ol' American domestic violence. 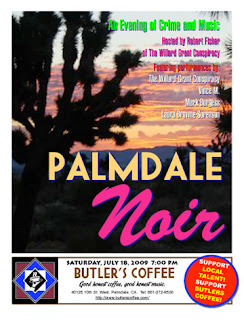 But there will be a whole different kind of crime going on in Palmdale, where The Thrilling Detective Web Site and Butler's Coffee are presenting the first ever PALMDALE NOIR: AN EVENING OF MUSIC AND CRIME on Saturday, July 18. Butler's is this funky little coffee shop that I've probably mentioned before, but anyway, they've been offering live music (with my bumbling interference) for the last six months or so, and this is definitely going to be something completely different. Robert Fisher, the front man of Americana noir collective The Willard Grant Conspiracy will be hosting a salon-type discussion and performance of songs about crime, aided and abetted by Vince M. (a singer-songwriter stuck on the lost highway somewhere between Townes Van Zandt and Paul Westerberg), Mark Burgess (primo slide guitarist and ace performer of bloody, muddy blues) and Laura Browne-Sorenson (angel-voiced singer-songwriter and member of Celtic folk group The Browne Sisters and George Cavanaugh). They'll all be performing individually and in various combinations, talking and playing about robbery, assault, thievery, cheating, lying and other assorted crimes, including of course everybody's favourite: murder. Possible songs to be performed include "Folsom Prison Blues," one that deals with stealing beer from a convenience store, Springsteen's "Stolen Car" and an old (auld?) murder ballad sung in Gaelic. It's going to be some kinda night. Butler's Coffee is located at 40125 10th St. West. Their telephone number is 661-272-9530. There's such a wealth of songs about crime and murder that we could probably do this for a year and never repeat a song. This needs to be a travelling road show, and it needs to come through Fort Worth. Well, considering the good citizens of Palmdale may run us out of town after the gig, it's entirely possible. Is He Rough Enough? Is He Tough Enough? Yes. 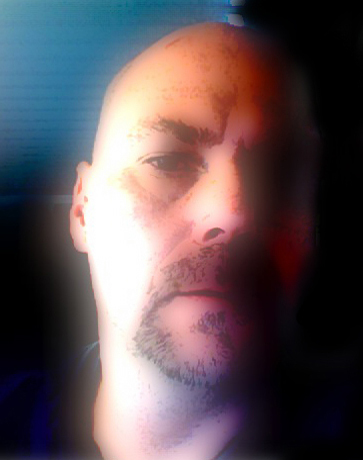 Who's Afraid of Big Bad Jack?